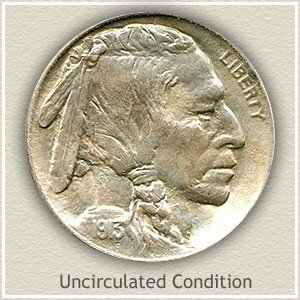 The 1913 nickel value ranges from $9 for a well circulated coin to over $480 for the rare 1913-S Type 2 Buffalo nickel in "Uncirculated" condition. 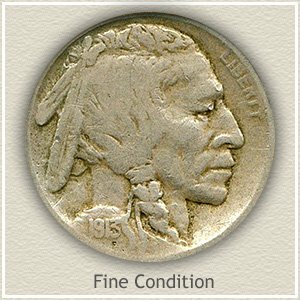 With an exciting start, a new design change began in 1913 introducing the Buffalo nickel. The beginning of a popular series with collectors and dealers. What makes this year unique in the series are the different variations of the coin. It was minted at three different mints, each with two distinct varieties. Combined, the 1913 nickel has six different possible value scales. And just to make it interesting, the condition of your coin further affects value within each nickel type. 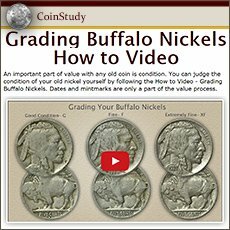 Starting with the value chart, let's go through these variables and discover how much your 1913 Buffalo nickel is worth. Buffalo nickels in 1913 were produced by three mints. Mintmarks were placed on the reverse of the coins to identify the mint of origin, "S" for San Francisco and "D" for Denver. 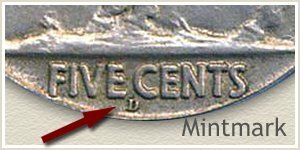 The main mint in Philadelphia did not use a mintmark. 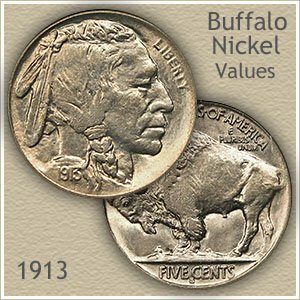 The Buffalo nickel series is avidly collected and 1913 nickels are important to any collection. Demand for examples in an excellent state of preservation has pushed 1913 nickel value for these gems to over $600. Gem Buffalos are best described as... No wear, full strike bringing up all details of design, outstanding eye appeal and the slightest of contact marks to the surface. Such a coin is very rare, reflected in the price. Past auction records have seen a few of these elite condition coins realize as high as $1,000. 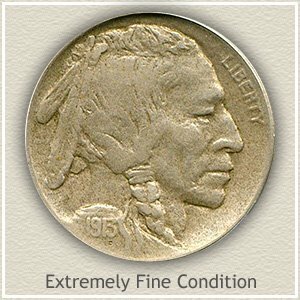 Achieving the best 1913 nickel value is a combination of date, mintmark and finding a coin in higher than average condition. Also, two different varieties of reverse designs were part of the 1913 nickel. The Type I, raised ground reverse and Type II, with "Five Cents" recessed into the ground. 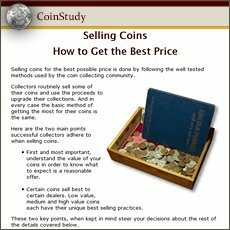 Determining if your coin is Type I or Type II raises or lowers the value. As seen in the chart a difference in "Grade" produces a large swing in the 1913 nickel value. Uncirculated: The ultimate grade to a collector. A nickel in this condition shows absolutely no evidence of wear, it appears brand new. Mint luster covers the entire surface of the coin. Examine the high points of the Indian's cheek and front leg and hip of the buffalo for a dulling of luster, indicating wear. 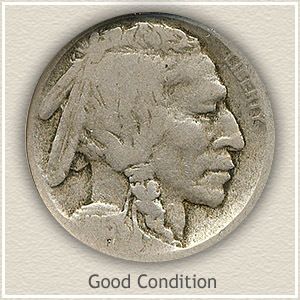 Fine: Also a collectable grade for a 1913 nickel, the coin has a pleasing but worn appearance. A full bold date with legends separated from the rims, increases this grade from a lesser one. Design details are visible on both the Buffalo and Indian. Good: A well worn coin defines this example. The date is readable although a merging of numbers is typical. Further wear of the rim, merges it into the lettering of the legends. Only major details of design remain on the obverse and reverse, producing a distinct flattening of appearance. Check all your buffalo nickel values with the chart. Rising prices, increasing demand from both collectors and rare coin dealers requires a second look at your coins. Including more relating to your 1913 nickel value. Easily find how much your old coins are worth. Coin Values Discovery... finds the 1913 nickel value and... all old US coin values. It is an excellent index with images and text links to all coin series, from Cents to Gold. Value charts, grading images and descriptions uncover how much your box of old coins is worth.